Bespoke aluminium cladding from Eltherington Architectural Solutions is set to transform the Manchester skyline when it is installed on the £35m Lightbox development. 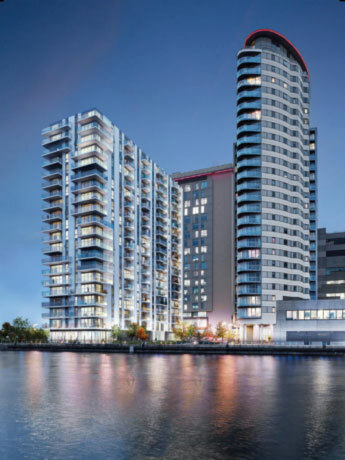 AHR architects specified 5,000m² of bespoke aluminium cladding panels for construction of Lightbox, a luxury residential apartment scheme within MediaCityUK. The £35 million project will comprise of 238 studios, one, two and three-bed apartments over 19 storeys. Residents will enjoy panoramic views over Salford Quays, Coronation Street and the Manchester skyline. Eltherington will be designing and manufacturing the bespoke panels at its advanced manufacturing facility in Hull. These will be delivered to site ready for rapid installation. The panels are being installed in various locations on the external façade. In order to achieve the exacting design requirements on this prestigious project, Eltherington is manufacturing each of the bespoke panels to a specific drawing reference and to millimetre tolerances. Eltherington provided the designers at Lightbox with an integrated solution by offering the cladding panels with its Hilti-Eurofox sub-frame system. The Eurofox system can be quickly and easily fixed to concrete, timber and steel structures, whilst anchors allow fastening of insulation and creation of the rear ventilated cavity. The Eltherington rainscreen façade system for Lightbox and Hilti fixings have been successfully tested in line with CWCT Standards. These tests include Air permeability, Water Penetration, Wind Resistance (Serviceability & Safety) and Impact. CWCT ‘Standard for systemised building envelopes’ sets a benchmark for high quality building envelopes and has now been adopted by National Building Specification (NBS) and National House Building Council (NHBC). 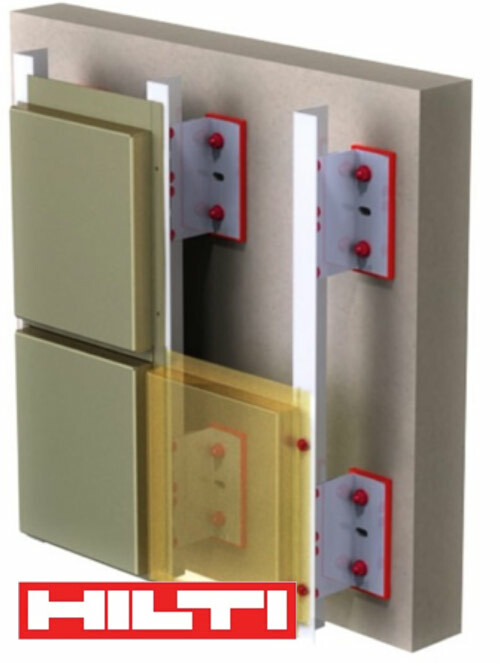 Eltherington is a member of The Centre for Window and Cladding Technology (CWCT). Eltherington has been manufacturing high quality architectural solutions for over 40 years. As a result of increasing demand, the company has recently invested several million pounds in advanced new machinery and moved to a new site in Hull that more than doubles its production capacity. The company manufactures a wide range of other architectural metalwork solutions including rainscreen cladding, column casings, roofline, internal cladding and spandrel panels. Recent projects supplied by Eltherington include The Edinburgh International Conference Centre, Bridgewater Place Leeds, Birmingham New Street Station, The Viacom Studios in London, and the RIBA award-winning London Southbank University. How to specify canopies for modular buildings? Canopies provide an effective solution on a range of modular, off-site and traditional buildings. There primary purpose is to cover a pedestrian or entrance area where they protect people from the elements, such as rain and snow. What other functions does a canopy provide? Most people create an impression of a building by the first thing that they see, and in the majority of cases that’s the entrance area. A canopy is a really effective way of adding architectural interest, making it a focal point and drawing visitors into the buildings. That makes it a really effective solution for retail or education where the building owner is looking to attract and engage with a wide array of people. What type of canopy designs are available? Our range of canopies are available in a wide range of designs from the aesthetically striking, such as curves and angular, through to functional designs. We can manufacture most shapes and sizes, which means the only limiting factor is where they are being installed. 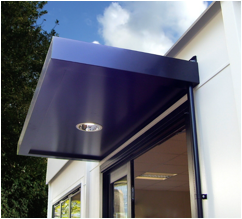 Cantilevered or overhanging canopies provide great protection from the wind and rain around entrance areas, whilst their sleek, gravity-defying design creates a striking first impression for customers and visitors. Our canopies are also frequently used to create a covered walkway between adjoining buildings. That makes them a great addition on university campuses, hospitals and schools, where people are moving often between buildings. Can you manufacture large canopies? We manufacture canopies to any size, including large canopies for forecourt and petrol stations. These can be manufactured to customized clearance heights, taking into account wind loads, rainwater drainage and access holes. Larger canopies can be supplied in a modular design to allow for efficient installation on site. Can you supply bespoke designs? Yes, our canopies can be supplied in bespoke sizes and designs. 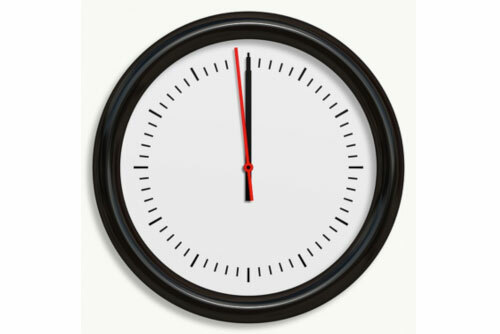 If you have a specific requirement, please email your requirements to sales@eltherington.co.uk or call: 01482 320336. What materials can canopies be manufactured from? Most canopies are manufactured from steel or aluminium. They can be PPC (polyester powder coated) or, in the case of aluminium, anodised. Both types of finish are available in a wide range of colours. All our finishes are supplied with a 10 year guarantee*. What tests apply to canopies? Eltherington’s 1000mm deep canopies in 1500mm, 2000mm & 2600mm widths have been tested to: BS 5950:2000 – Structural use of steelwork. What is the weight of a canopy? What canopy accessories and options does Eltherington offer? All Eltherington canopies carry a 10 year guarantee. For more information on our range of canopies, click here. Rainscreen cladding systems have been used for decades in the UK. As a lightweight low maintenance façade, they provide designers with an ability to create cityscapes that are distinctly different and because of that reason alone it is gaining in popularity. All rainscreen cladding consists of an outer façade panel that can be made from a variety of metals including aluminium, corten and steel, plus others, which is mounted on a framing system. This frame creates a rear ventilated cavity between the reverse of the panel and the main building structure. It is the simplicity of a rainscreen cladding system that appeals, in the sense that the constant circulation of air up through this rear ventilated cavity keeps the underlying structure dry. It is now common to see rear ventilated rainscreen cladding systems used on both new build and refurbishment projects. Aside from being lightweight and low maintenance it is preferred by many building owners and designers because it provides a number of important performance benefits. The main benefit is that the rear ventilated cavity created by suspending the panels off the walls of the building using the framing system enables air to constantly circulate though the rainscreen system. This air forces any moisture such as wind blow rain that penetrates the joints between the outer cladding panels out at the top of the façade, preventing it reaching the main building structure. It is a well-known fact that damp or wet walls from wind-blown rain results in more rapid heat loss from inside the building. This happens because as the moisture evaporates from damp walls it causes heat to be lost, just as we all know, when we get our cloths wet, we cool down faster! It’s just the same with wet masonry walls, which means that a wet wall is a cold wall. The rear ventilated cavity of a rainscreen cladding system prevents walls getting wet and so forms an important part of maintaining the overall energy efficiency of the building. Another reason to keep masonry walls dry is because constant wetting and drying action can result in flaking and spalling of the surface. Eventually, this can result in more serious issues such as exposure of reinforcing bars which have the potential to affect the integrity of that specific elements as well as looking unsightly when it causes staining on the concrete. The single most useful benefit, therefore, of rainscreen cladding is that the majority of the rain is stopped before it reaches the inner wall. Any small amount of rain that penetrates between the cladding panel joints is carried away by the updraft in the cavity, or drains out at the bottom of the cladding. By doing this it is prevented from ever reaching the outer face of the building. Apart from understanding how rainscreen cladding works, our architectural team manufacture and supply a wide range of façade solutions. These are supported by an aluminium framing system. The majority of our customers choose our Hilti EuroFox Rainscreen Cladding Support System, which comprises a range of aluminium brackets and rail profiles used as a sub-frame to support cladding on the external or internal wall structure of new or existing buildings. The frame, which is completely hidden in the rear ventilated cavity, is anchored back to the main building structure and is an integral part of facilitating the updraft of air through the cavity. It is this cavity which allows ingress of air at the bottom of the cladding and egress of at the top. The top of the cladding is usually baffled to avoid rain ingress. Any moisture from windblown rain, or condensation caused by changes in temperature of the cavity through the breathing process of the building, are expelled from the rainscreen cladding system as the updraft of air flows through the cavity. In all cases the masonry wall is kept dry. Although, we’ve focussed mostly on; what is a rainscreen cladding system?, we shouldn’t overlook the fact that introduction of modern cladding materials and finishes such as corten, ACM (Aluminium Composite Material), copper and zinc provide designs and architects with the ability to create rainscreen cladding systems that look good, too. Another reasons why more designers are specifying Eltherington rainscreen cladding is because we are able to manufacture an integrated façade solution. That includes rainscreen façade systems that are perfectly integrated with our roofline, column casings, spandrel panels, and window pods. They can all be made from exactly the same material and finish, which ensures a perfect match! We are also able to supply screening and perforated panels as well as a range of specialist fabrications. Along with its building performance benefits, rainscreen cladding systems provide designers with the ability to transform an ordinary development into something extra-ordinary. And, behind these facades, the rear ventilated cavity is providing protection to the building that is completely hidden from view but which is essential to long term efficiency and low maintenance. 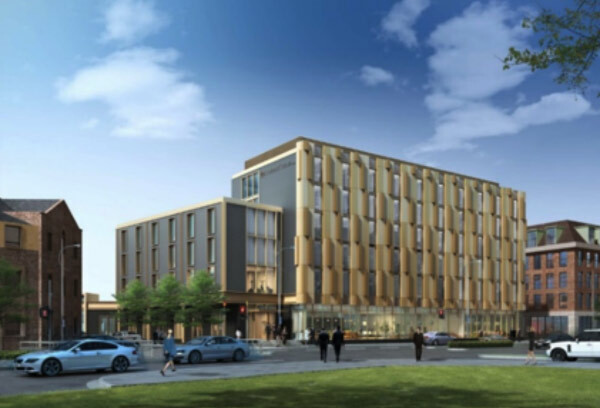 Eltherington has manufactured and supplied the main rainscreen façade and internal column casings for the new £25m DoubleTree by Hilton in Hull. The façade, designed by leading architects Aros, fuses the city’s industrial past with Hull’s contemporary City of Culture outlook. Executed in Eltherington’s powder coated aluminium with a gold-effect finish, the SFS1 through-fix rainscreen façade panels, in combination with the company’s Hilti EuroFox hanging system, create a striking and dramatic aesthetic on Hull’s cityscape. The ability of Hull-based Eltherington to manufacture a wide range of architectural metalwork solutions meant that the company’s column casings were also specified for the ground floor lobby area, again in aluminium gold-effect powder coated finish. In combination with the anthracite-coloured fibre cement on the lower exterior elevations, the rainscreen façade and column casings add an element of style to the design that will become an outward projection to guests of the Doubletree by Hilton brand. 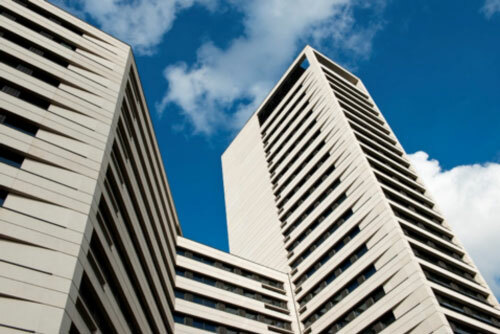 CWCT sets standards and publishes guidance for cladding and window systems, which provides specifiers of building envelopes with the reassurance that the façade system meets the highest, independently-set, benchmarks. Eltherington, which is based in Hull, supplied the Hilti Eurofox sub-frame system for fixing the façade to the underlying substrate. This created a rear-ventilated façade, which provides the building with a number of performance benefits. Principally, it enables air to constantly circulate behind the cladding panels, preventing moisture reaching the main structure. The 159-room Doubletree by Hilton, located close to Hull city centre, is the latest high profile project to be supplied by Eltherington. 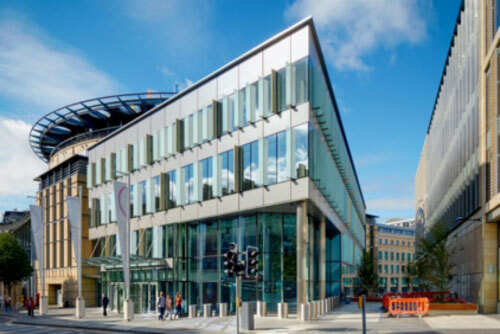 Over the last few years the company has supplied architectural facades to projects as diverse as Birmingham New Street Station, Edinburgh International Conference Centre and multiple residential and retail developments around the UK. Eltherington offers a wide variety of materials and finishes to meet specific design requirements. These include aluminium, stainless steel, ACM and engineered HPL Formica. The company is an official supplier of the market-leading Hilti EuroFox rainscreen cladding support system, which provides fast, safe and easy installation. Eltherington also offers a through-fix (TFS1) rainscreen cladding system, again in combination with EuroFox system. DoubleTree has been the fastest growing Hilton brand by number of properties since 2007, with over 490 locations around the world. 26-27 Grafton Street in Dublin, which features anodised aluminium vertical bullnose columns from Eltherington, has been nominated for the prestigious RIAI Irish Architectural Awards 2017. The Royal Institute of the Architects of Ireland (RIAI) Awards showcase the very best of Irish architecture, with winners selected from a public vote. Eltherington manufactured the bullnose columns in anodised aluminium at its advanced manufacturing facility in Hull. The contemporary façade was supplied, designed, fabricated and installed by Dublin based Gunn Lennon Fabrications. Eltherington bullnoses and column casings can be supplied in a wide range of materials and manufactured in any size or shape. They are available in aluminium, stainless steel, copper and zinc material, amongst others. 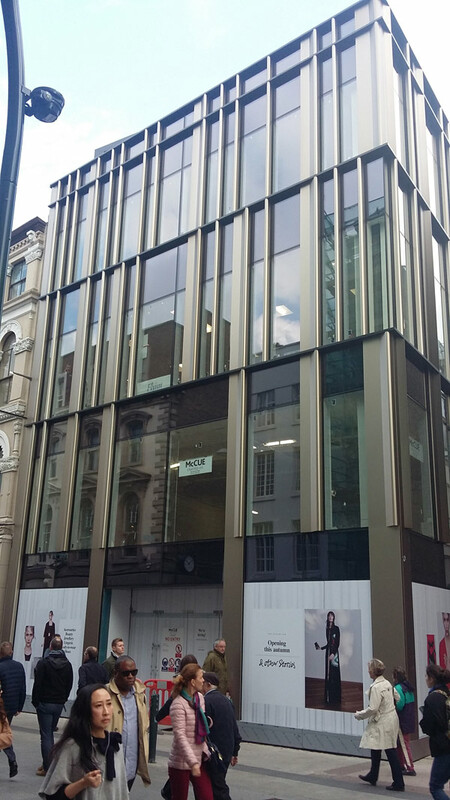 26-27 Grafton Street was designed by Burke-Kennedy Doyle Architects for Aviva Investors. The design concept aims to achieve outstanding contemporary expression with a particular focus on specifying the highest quality materials. A large new retail unit extends from basement to first floor, with refurbished office floors above. The series of slender vertical bullnose columns in combination with the glass panels define the geometry of the new facade. A set of thin horizontal lines form a series of cornices, one at each floor level, picking up on the horizontal cornice lines on the adjoining street buildings. Eltherington’s ability to manufacture curved, angular, elliptical and complex bullnoses / column casings was the principal reason why Gunn Lennon Fabrications choose to partner with them on this project. 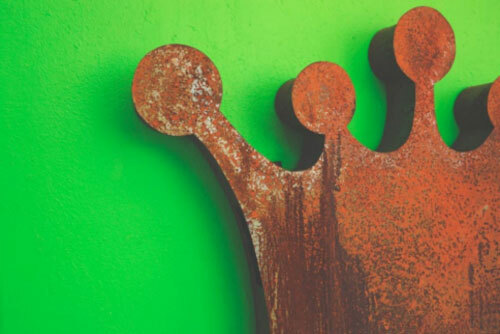 The company has a comprehensive range of in-house finishing capabilities including Dec-El printing, which allows it to create an almost limitless array of shapes, styles and surface patterns. Eltherington has manufactured high quality architectural facade and roofline solutions for a wide range of projects throughout the UK and overseas. Many of which have won critical acclaim. Recent projects supplied by the company include The Edinburgh International Conference Centre, Bridgewater Place Leeds, Birmingham New Street Station, The Viacom Studios in London, and the RIBA award-winning London Southbank University. What are the benefits of metal rainscreen cladding systems? 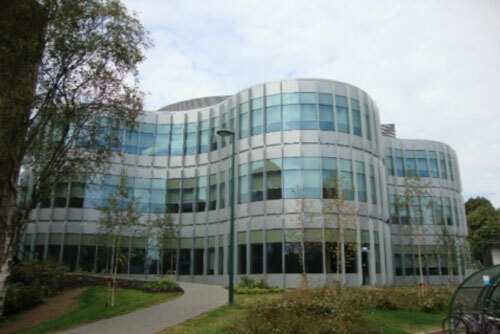 The modern concept of rainscreen cladding was developed in Scandinavia during the 1940′s and it became widely used throughout Europe in the 1970′s and in the UK in the 1980s. Metal rainscreen cladding systems provide an efficient, attractive and low maintenance solution for a wide variety of external building envelope and facade requirements, with aluminium cladding being one of the most popular. Aside from its outstanding aesthetics, aluminium rainscreen cladding systems put less loading on a building’s underlying structure compared to traditional masonry-based materials. This results in a lower carbon footprint and higher levels of natural daylight, as the need for internal supporting walls is minimised. 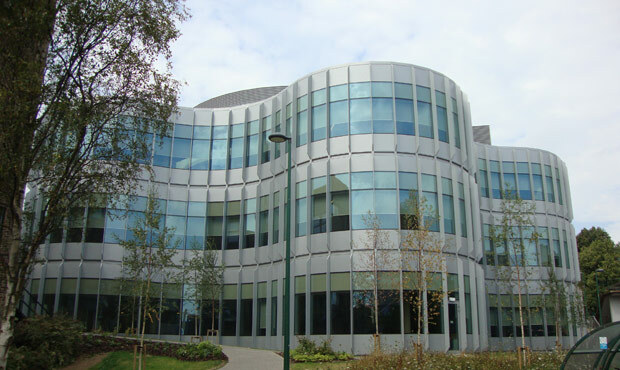 As a result, aluminium rainscreen cladding systems are now commonly specified on most major developments. A great example of how aluminium cladding can bring a building design to life is the Edinburgh International Conference Centre (EICC). We supplied the aluminium rainscreen façade for this project, which used a secret fix hanging system to create a sheer, smooth façade. Aluminium is an ideal architectural material because it is low maintenance and looks great. It can be finished in a range colours and textures. These include anodised finishes, in a choice of metallic colours and PPC (Polyester Powder Coated) to any RAL colour reference. Perforated aluminium cladding panels also create a stunning architectural aesthetic, and can still deliver all the benefits of a rear ventilated rainsceen cladding system. In terms of aesthetics, the perforations add depth and texture, creating shadow lines and patterns that change depending on the angle that they are viewed and the level of sunlight. Where brise soleil is required around windows, specifying these in the same perforation design as the cladding panels creates a stunning three-dimensional façade aesthetic. Our aluminium rainscreen cladding is an inspirational choice for buildings like the EICC, which demand uncompromising aesthetics alongside durability. The timeless design qualities of an aluminium façade solution, combined with the materials other physical properties, means it is now widely specified on most large buildings. We also offer other metal rainscreen cladding systems such as Corten weathered steel, stainless steel, zinc, copper and brass. Alongside our metal rainscreen cladding solutions we are able to manufacture a full range of other elements required to complete the facade. These include window reveals, fascias, soffits, roofline and column casings. We also offer a wide range of specialist fabrications to meet specific design requirements. Rainscreen cladding is an excellent method of protecting the exterior wall of a building from the elements. In fact, materials such as aluminium cladding will ensure your building and future owners benefit from very low maintenance, whilst the rear-ventilated cavity prevents moisture reaching the main building structure. This provides a number of performance related benefits by keeping the underlying elements continuously dry. The use of lightweight facade materials like aluminium panels mean that the loadings on the underlying building structure are much less than masonry-based materials. That means significant savings can be made on foundations and internal supporting walls, both of which tend to be made from high embodied energy materials. Reducing the need for masonry elements also creates a lighter, brighter and more open interior. Modern rainscreen cladding systems allow individual panels to be removed, giving your maintenance team easy access to services. When combined with davits and Building Maintenance Units (BMU), which allow safe access to the exterior façade, it means any upgrades or repairs to services can be done without disturbing the occupants. Rainscreen cladding is a low-cost method of improving the thermal performance of existing buildings, without losing any internal floor space. This is known as over-cladding and involves fixing slab insulation to the exterior wall of the existing building - so no loss of internal space - and then covering it with a breathable membrane before 'over' cladding with a rainscreen system. As well as making a step change in the building’s energy efficiency, it makes it look like new, too! Aside from better thermal performance, over cladding an existing building can greatly improve its appearance. In fact, it makes an old building look and perform like new. This is an excellent way of modernising older properties, or ensuring that new builds have contemporary appeal. Modern rainscreen cladding systems are lightweight and strong, making it relatively easy to create engaging, striking designs that appear to defy gravity. 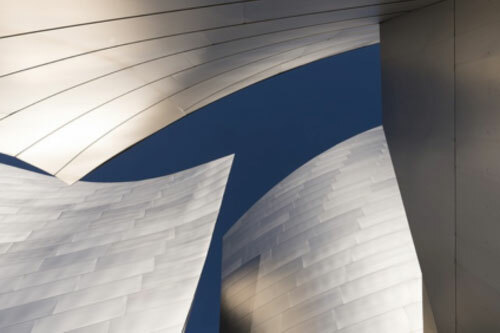 Whether it’s an overhanging canopy, parabolic curve or gouged-out aperture in a façade, our lightweight and strong metal rainscreen cladding systems can help you deliver the vision. Over cladding makes sound environmental sense. 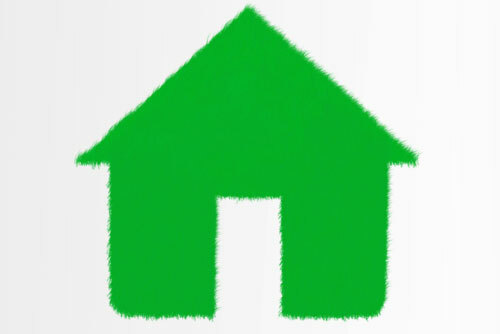 Firstly, the improved thermal performance from extra insulation means less energy is required to heat the building. Secondly, refurbishing a building in this way, rather than going down the route of demolition and new build, means that fewer materials are required and less energy is used during construction. Being lightweight makes rainscreen cladding systems relatively easy to install. Here at Eltherington we pre-assemble cladding systems in our factory to make sure they fit right, first time, on site. Whatever your budget, we have a material or finish that will help you achieve your vision. Whether it's an aluminium rainscreen system or corten weathered steel, we have a solution to suit. Rainscreen cladding meets the requirements for off-site construction, which means it is relatively fast to fit on site. That's because many of the items are pre-assembled in our factory, allowing large elements to be craned into position on site. Being a dry construction technique also means that it isn’t affected by inclement weather that could stop wet trades. Call our sales team to find out more about the benefits of Eltherington rainscreen facade systems: 01482 320 336. Eltherington is now an official supplier of the Formica VIVIX® range of architectural panels. The latest development to benefit from Formica VIVIX® panels from Eltherington is Barr Beacon School in Walsall. 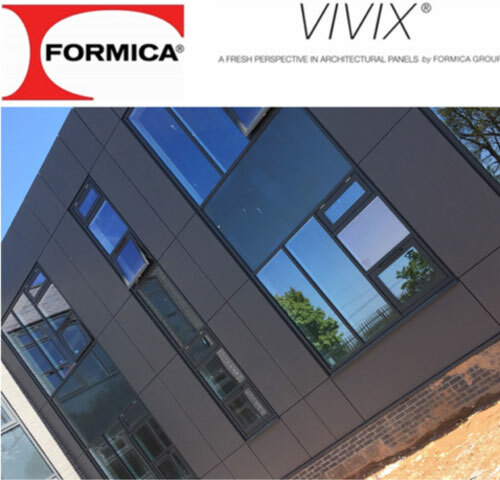 The company supplied 8mm Formica VIVIX® panels in Storm Grey, which were fixed using its Eurofox façade mounting as part of a rear ventilated cladding system. Formica VIVIX® panels, which have a decorative surface on both sides, provide building designers with the ability to create eye-catching, contemporary architectural facades. 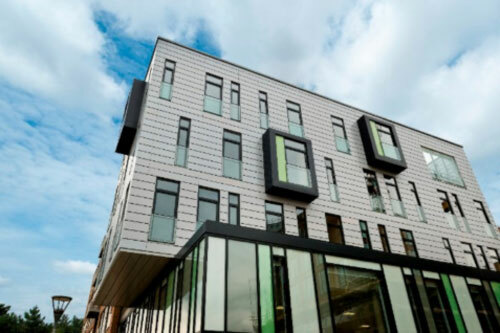 Eltherington is able to manufacture a wide range of façade solutions using the Formica panels, including rainscreen cladding, roofline, internal cladding, spandrel panels, plus any other architectural panel and screening requirements. 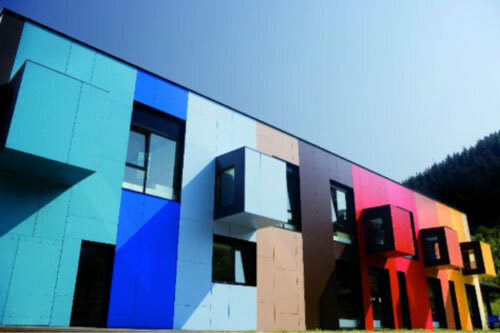 Formica VIVIX® solid phenolic is a high performance, engineered exterior façade panel that is available in a wide choice of colours. The Formica VIVIX® range from Eltherington is available in Solid colours, Nature-inspired abstract patterns and Rich woodgrains. All the panels are resistant to impact and abrasion, making them highly suitable for cladding, walkways and balconies. As a lightweight rainscreen cladding solution it combines excellent weather and UV resistance properties for enhanced durability and ease of maintenance. Eltherington is able to manufacture the panels to any shape or size at its modern manufacturing facility in Hull. They are available in 6mm, 8mm and 10mm panel thicknesses. Formica VIVIX® rainscreen can also be used to over clad an existing building to make it look and perform like new. Formica panels can be used with a variety of fixing systems, from simple timber battens to proprietary Hilti Eurofox framing systems. Eltherington is an official supplier of the Hilti Eurofox substructure system for architectural facades. The system is commonly used to create rear ventilated rainscreen systems because it is high quality, fast, safe and easy to install. Eltherington has reported a surge of interest in its Corten architectural metalwork solutions as building designers look for facades that offer aesthetic appeal, low maintenance and value for money. Façade finishes such as Eltherington’s weathered steel, commonly known as Corten, have the ability to make a building look distinctly different. It is this aesthetic appeal, which develops a beautiful, aged patina over time that appeals to building designers and clients alike. Apart from its superb aesthetics and attractive granular texture, Corten architectural metalwork from Eltherington is renowned for its superior corrosion resistance. 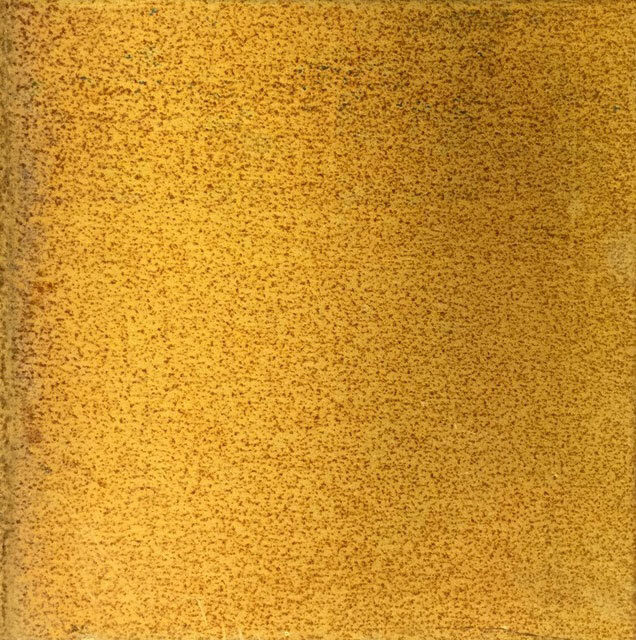 The material acquires this property because the surface of the steel reacts with atmospheric elements to form a protective oxide layer. That means that the surface of Corten forms a maintenance free, protective surface layer that continues to regenerate over the years - the great thing about Corten is that it doesn’t need any maintenance. Requiring minimal maintenance means that it is a cost effective solution that offers an extended surface life. It is 100 percent recyclable, offering specifiers a sustainable and environmentally sound solution. Eltherington manufactures a wide range of façade solutions from Corten including rainscreen cladding, roofline, window pods, screening and decorative panels. The company is also able to manufacture a wide range of bespoke architectural metalwork using Corten as well as other materials. Corten architectural solutions from Eltherington offer excellent fire, acoustic and thermal performance, making it an integral part of a modern building design. As an alternative to Corten, Eltherington is able to supply 4mm thick aluminium composite material (ACM) with a patterned finish to imitate a variety of natural metals, including Corten, where there are budget constraints. Other ACM material effects offered by Eltherington are copper, zinc, Corten, stainless steel and anodised aluminium. These offer great value for money alternative. Hopkins Architects Partnership LLP has specified our Specialist Fabrication (SF1) and Cladding (TFS1) for the complete redevelopment of Nottingham University’s Engineering and Science laboratory. The cladding is continuous around both the new and refurbished elements, making it appear as though it is now a single building. Our façade solution has helped to transform the campus as well as enhancing the student learning experience. The refurbished laboratory will achieve a BREEAM 'excellent' rating. We can supply a vast range of materials and finishes. To view these click here. Rainscreen facades provide buildings with known performance benefits, whilst minimising the carbon footprint due to their lightweight yet strong nature. This enables Eltherington rainscreen cladding, combined with the Eurofox hanging system, to create elegant, geometric building designs that appear to defy gravity. When combined with the wide range of colours and finishes offered by Eltherington it makes a compelling proposition for customers. Eltherington (TFS1 through fix) and (SFS1 secret fix) solutions have been independently tested and accredited to the specific requirements of CWCT using the Hilti substructure system. 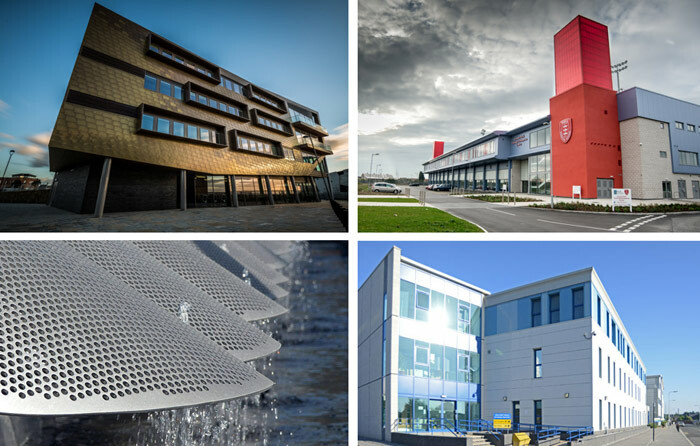 Eltherington operates a 12 acre state-of-the-art manufacturing facility in Hull and is able to supply a wide range of standard and bespoke solutions for building facades, roofline, column casings, perforated panels and spandrel panels, along with internal cladding. Eltherington has been manufacturing high quality architectural solutions for over 40 years and has supplied projects as diverse as The Edinburgh International Conference Centre, Bridgewater Place Leeds, The Viacom Studios in London, and the RIBA award-winning London Southbank University. Eltherington is marking the start of Hull’s City of Culture 2017 by showcasing some of its recent architectural metalwork projects on view around the city. Most recent of these is C4DI (Centre for Digital Innovation), which thrusts a striking new aesthetic on the Hull skyline. Eltherington manufactured C4DI’s high quality bespoke aluminium window pods at is headquarters based just outside the city centre. Now complete, the development announces a new point of arrival on Hull’s well-known Queen Street. Another development that showcases Eltherington’s architectural metalwork capabilities is The Arc. Manufactured from perforated aluminium panels, it creates a dramatic, visually appealing structure in the centre of Hull, whilst the perforations provide practical benefits by allowing maximum light into this environmentally-friendly, low-carbon building. Eltherington manufactured The Arc’s curved, perforated panels from marine grade aluminium, a high strength alloy with good corrosion resistance and excellent resistance to salt water/industrial atmospheres. Alongside this, Eltherington supplied all the aluminium elements on a 14 storey residential building in the heart of Hull. 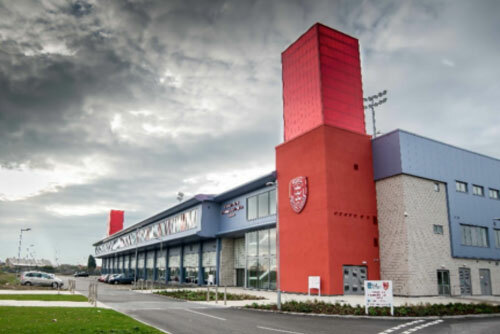 It also supplied column casings for the internationally-renowned Hull KR Rugby league stadium and various health centre buildings in the city. Eltherington, which currently employs around 200 staff, has been manufacturing high quality architectural metalwork solutions in Hull for over 50 years. The company supplies around the UK as well as international markets as far afield as America, Middle East and Russia. Alongside its architectural solutions, Eltherington operates a metal stockholding business in the city, including a Sales Counter. The company’s extensive leisure products manufacturing business supplies many of the caravan and leisure home companies in an around Hull. In 2016, following continued business expansion, Eltherington made a multi mullion pound investment in a new manufacturing and office facility on Hedon Road, Hull, having outgrown its existing premises on Dansom Lane South. The move to the new premises will be completed in the first half of 2017.